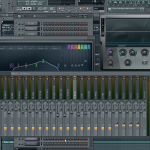 The first step in FL Studio after installation is setting up your audio interface or soundcard in FL Studio. This step is essential to getting audio out of FL Studio and recording audio. Depending on your setup your audio interface may be an onboard soundcard in your pc, a usb device, a fire wire device, etc. 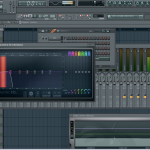 This tutorial will help you with selecting your device in FL Studio and applying the appropriate settings. The first step is to navigate to the audio settings menu in FL Studio. This can be done by pressing the F10 key on your keyboard. It can also be accessed by navigating to the options menu and selecting audio settings. After clicking audio settings you will be in the system settings window. Click the audio tab (Icon has a speaker and the text “Audio”). The input / output area contains a drop down box. This is the area you will select your audio device. If you have an ASIO compatible device you want to use ASIO drivers for your set up as they will provide a lower latency value for FL Studio. If you do not have a sound card that has ASIO drivers it is recommended that you download ASIO4all drivers. The ASIO drivers will enhance performance when recording audio. In the input / output area you will notice two different sections for audio devices. As mentioned above, be sure to select an ASIO device if applicable. If not choose Primary Sound Driver. Once you have selected your sound card or audio interface you may or may not have to adjust ASIO settings. By clicking show ASIO panel within the system settings window you can adjust the settings for your ASIO drivers. These settings should only be adjusted if you are experiencing latency when recording, playing a midi keyboard, or having issues with CPU usage. Setting the buffer length shorter will reduce latency but put a larger strain on your CPU. Try different settings to find the optimal performance area. It may also be wise to adjust settings according to your needs. For example: Reducing buffer length during recording, but lengthening it when mixing. 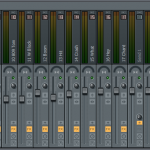 Setting up your audio interface or soundcard in FL Studio is a pretty simple task. 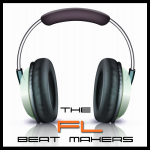 FL Studio is one of the more user friendly audio production software programs for this task. If it all possible be sure to use ASIO drivers for getting the best performance out of FL Studio. I wanna have the beatmakers guide on frensh language Please.